Emory's College Council hosts Social Justice Week with a diverse slate of events, including this year's "State of Race" featuring Saturday Night Live cast member Sasheer Zamata. 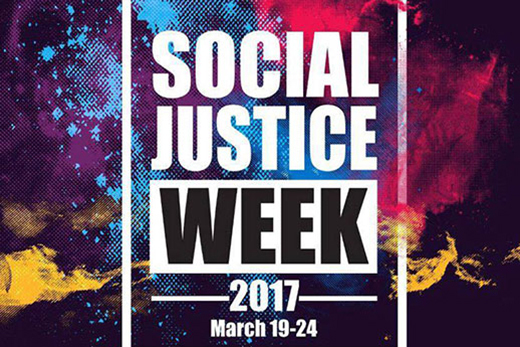 "Be a Warrior" is the slogan for this year’s Social Justice Week with a variety of events and activities planned for Sunday, March 19, through Friday, March 24. “Our goal for the week is visibility and engagement — through our art pieces that will be prominent around campus, multiple events throughout each day, and looping in groups who already carry following and clout among students,” says Sania Chandrani, who is organizing the week with fellow student Arooj Khalid as the two vice-presidents of programming for Emory College Council. “There are so many facets of social justice that our primary focus was to figure out how to highlight a slate of social justice themes while attempting to provide more than surface-level insight into each one,” says Chandrani, a Goizueta Business School student. This year’s "State of Race" speaker will be actress and comedian Sasheer Zamata, a cast member on Saturday Night Live, who also serves as an ambassador for the American Civil Liberties Union. She speaks Friday at 7 p.m. in the WHSCAB Auditorium. “By bringing in Sasheer, we're hoping to engage not only people who are already invested in social and racial justice, but also those who might not organically go to a talk titled ‘State of Race,’” she notes. “Over the course of the week we're delving into religious diversity, activism through art, celebrating different sexualities and gender identities, mental health, sexual assault prevention and advocacy, activism through government lobbying, and racial justice," she says. "I know there must be some things missing from this list, but we've tried our best to create a broad scope for the week, something we hope will engage our peers and empower them to do similar work to educate and lead their peers,” Chandrani explains.